For the fourth time in just nine missions, the 392nd was again assigned Bremen as its target. The 577th Squadron led the Group which launched twenty-two ships for the mission. 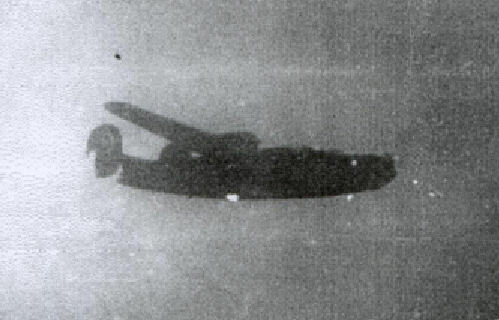 Twenty-one (21)B-24s were over target releasing 1,134 100# bombs on the primary aiming point using PFF methods with good results. Again heavy AA defenses and enemy aircraft attacks were experienced. Some 8-10 single and twin-engine fighters pressed attacks but no gunner claims were made. One aircraft was lost on this mission, cause listed as unknown. 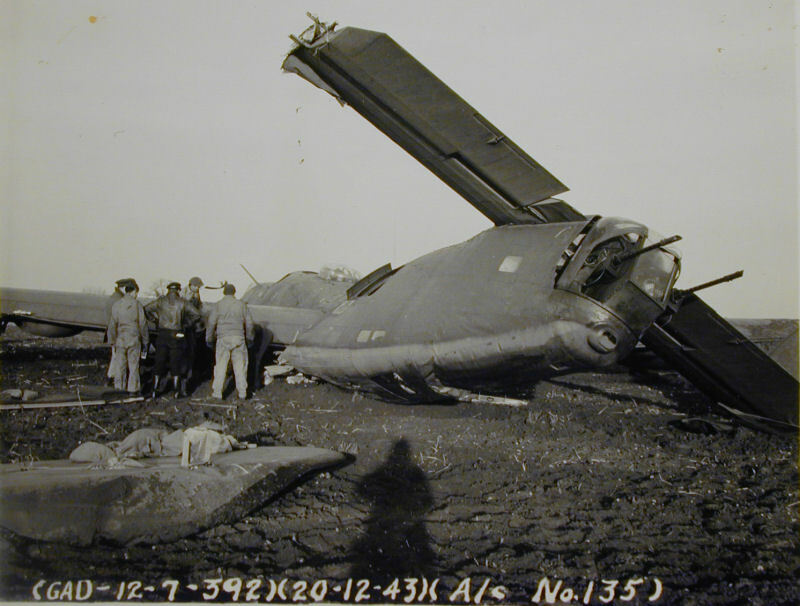 Fifteen (15) were damaged, the major cause of which was resulting flak AA fire including one B-24 which crash-landed. Casualties for the Group were heavy once again over this target as one aircrew member was KIA, (11) members were MIA and (4) were injured. Total flight time for this mission was 6:30 hours. MISSION LOSS CIRCUMSTANCES: No eye-witness accounts exist on this aircraft loss from returning 392nd aircrew debriefings. INDIVIDUAL ACCOUNTS OF CREWMEN FATES: After the war, Lt. LoPresto made a sworn deposition concerning the mission and, in particular, events surrounding the loss of Lt. Siggs, the crew Navigator. In this report he noted that the entire formation had come under intense enemy fighter attack at the Initial Point (IP) for the bomb run - which lasted all through the target and afterwards. His ship took numerous flak hits over the target, and again fighter gun fire after the target. 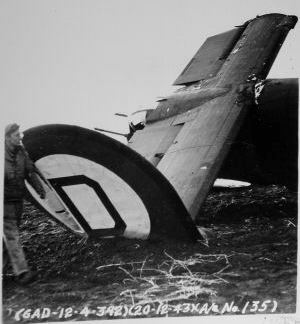 Aircraft damage was so grave then that he ordered abandon ship at an altitude of about 21,000 feet. He related that his Bombardier, Lt. Machak, later told him that the Navigator was prepared to bail out through the ship’s nose wheel well, but changed his mind to go out the bomb bay instead. This event of Lt. Siggs crawling toward the bomb bay area was the last seen of him. At 10,000 feet, the Pilot’s report indicated that he then bailed out, having been assured in his mind that all other members had done likewise. Just as the Pilot bailed out, the ship took more severe hits in the lower part of the flight deck from attacking fighters so that he did not know for certain whether Lt. Siggs was in that part of the plane or not, attempting to reach the bomb bay area. He noted lastly that the aircraft was then very close to the North Sea and thought that it crashed in the water as it was never found from what he had learned later. On 31 August 1945, a higher headquarters followup reported that interrogation of Lt. Collins, the Co-Pilot, also verified that the Navigator, Lt. Siggs, must have been wounded or killed in the final enemy fighter attacks and crashed with the plane. Sgt. Ross, another crew member, stated also that he had observed Lt. Siggs kneeling and about to enter the bomb bay area when the explosion of the latter occurred and this conflagration occurred in the very location where Lt. Siggs knelt. Sgt. Ross’ statement was dated 2 November 1945, Gainesville, Texas. A German report (barely readable) of 20 December stated that Lt. LoPresto and other surviving crew members were taken prisoner on the same date between 1130 and 1500 hours northwest of Bremen. Three (3) members were reported by the Germans as found dead, but were listed as "unknowns" in identity. A German report said S/Sgt Plucket was seriously wounded and had been placed in an infirmary. BURIAL RECORDS: Three members were reported by the Germans as found dead, but were listed as "unknowns" in identity. These men were interred on 20 December near Lebenstedt at Army Station Cemetery Wessermunde-Geestermunde in Section III, Field K, Row 1, Grave I. Sgt. Gilliam's body was found and identified by his dog tags almost one month later on 19 January 1944. He was buried in the same Army cemetery in Grave #116. Two members of the crew are interred at the Netherlands American Cemetery (Margraten): Hawkins in Grave D-20-20 and Sambanis in Grave O-20-1. An Air Medal and Purple Heart were awarded to Hawkins and a Purple Heart to Sambanis. No records exist on the subsequent burial of Gilliam or the ultimate recovery of Lt. Siggs' body. NEXT OF KIN DATA IN WWII: No such list exists in the MACR record. However, South Carolina was listed as the home state for Hawkins and Rhode Island for Sambanis. The last known city of residence in 1945 for LoPresto was Los Angeles, California, and for Ross, Gainesville, Texas. S/Sgt Donald D. Pippitt was the tail gunner aboard B-24H 42-7510, El Lobo. All reports agree that S/Sgt Pippitt's tail turret and the plane's starboard rudder were suddenly severed from the rest of the plane and that he fell to his death. The accounts differ, however, on what caused the tail turret to be cut off. 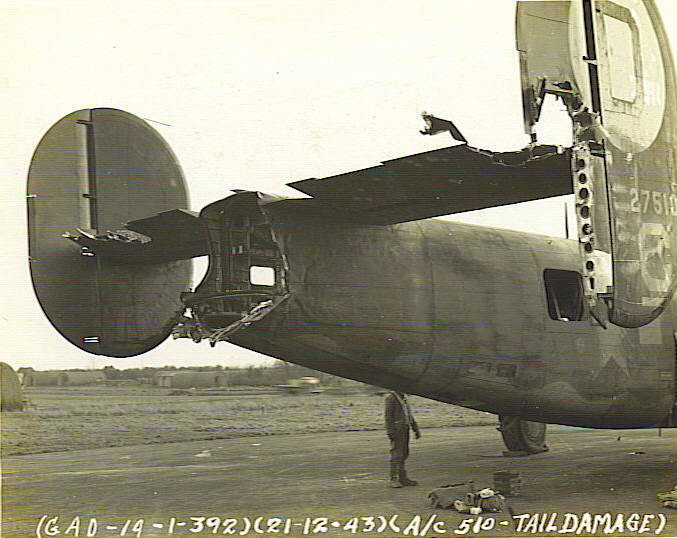 According to one story, at approximately 1130 hours, B-24 #42-7494 from the 446th Bomb Group was hit in the #4 engine by a direct flak burst while flying over Texel Island, The Netherlands. The propeller flew off, spun through the air, and cut off El Lobo's tail. S/Sgt Charles A. Piper, aboard 2/Lt Higgins' aircraft, remembers it differently. He thought El Lobo got caught in the slip stream and abruptly lost speed. In fact, it looked to him like the plane was flying backward. It went directly into the propeller on the plane directly behind it. He saw the tail turret tumble down and hit the water. An article in the 392nd's Group History file at the National Archives recounts that "With 45 minutes of flying time remaining before bombs away, a light jar was noticed by Lieutenant Peyton and the bomber's crew. Almost immediately, the engineer, from his post in the top turret, reported that nearly all the tail assembly had been sliced off by the propellers of another aircraft, which disappeared as mysteriously as it came." Pilot 2/Lt Peyton was quoted as saying, "The right rudder and elevator were completely out. One rudder and about four and a half feet of control surface on the left elevator remained. The trim tabs did not respond to controls, and there was a slight tendency to skid on turns. But the ship fought on. Looking back now it seemed to me that I assumed El Lobo would keep on flying. I had no doubts about it. The controls were a little sluggish, but I had no difficulty in keeping the aircraft in formation. I was a little surprised at the extent of the damage when I reached the ground in view of the way El Lobo stayed in there and continued on our course." Engineer S/Sgt Orville. L. Smith was quoted as saying, "The tail was a way up in the air…It did not stop the ship, however. The Liberator is a very stable bomber. The oxygen and electrical supply, and all mechanism except the interphone worked surprisingly well. And another thing, the control cables were not jammed by the accident. It was lucky the doors into the tail section had been closed. Otherwise the suction would have probably pulled the waist gunners right out of the aircraft too." Researcher Hans Nauta has learned that the tail turret was found at a small dune valley called Moesvlakje near beach pole 14 in the dunes called Westerslag on the west side of Texel Island. S/Sgt Pippitt's body was found and identified the same day and buried the next day in the local cemetery of the village of Den Burg. He is now buried in the Netherlands American Cemetery in Grave H-4-3. Although this photo of 42-7510 on its return from Bremen is dark and fuzzy, it clearly shows that the tail turret is gone. This close-up shows the extensive damage to El Lobo's tail on 20 December 1943. She was transferred the same day to the sub-depot for repairs and was returned to the 392nd on 19 January 1944. Her next mission was on 21 January 1944. S/Sgt Johnson, a member of 1st Lt Everhart's crew, was aboard plane #41-29135, nicknamed Last Frontier. On its return to Wendling, the plane was seen circling at low altitude while the flight engineer tried to force the nose wheel down. The three functioning engines suddenly cut out and the airplane crash-landed at approximately 1530 hours in a field near the base. S/Sgt Johnson, the flight engineer, was trapped in the lower fuselage and died before he could be extricated. 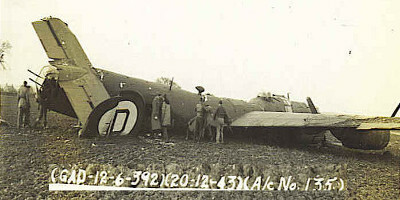 The engine failure was caused by battle damage sustained over the target area. A press release in the 392nd Group History Folder in the National Archives gave different details about this tragedy: "Technical Sergeant T.E. Johnson of Clinton, Oklahoma, an engineer-gunner, came back from an especially hazardous mission to Bremen. Flak had damaged his aircraft severely, knocking out two engines. Over his home base, the other two quit. Interphone communication out, the pilot called out for a crash landing. The engineer knew that one of the gunners was caught in the nose of the bomber-a sure death trap on a crash landing. Realizing that the gunner could not have heard the order for a crash landing, Sergeant Johnson crawled into the nose and, without stopping to explain, pulled the gunner out. With precious seconds slipping by as the bomber came closer to the earth, Sergeant Johnson stepped back into the bomb bay and threw the gunner to safely on the flight deck. Sergeant Johnson never escaped from the bomb bay. He was awarded the Distinguished Service Cross posthumously. He had been awarded the Purple Heart. 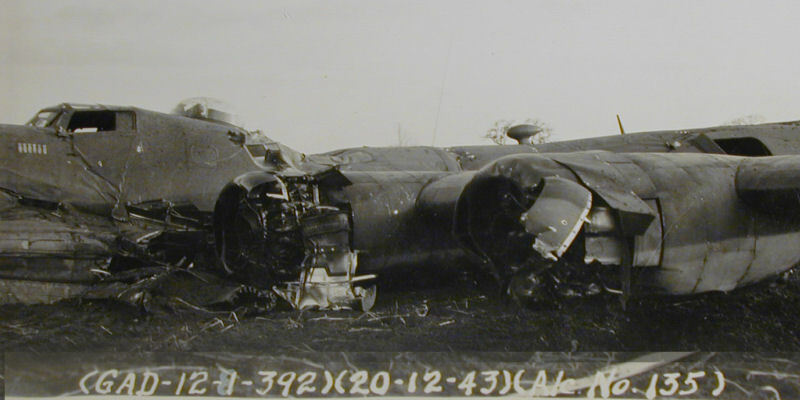 These photos shows the crash of #41-29135 in which S/Sgt Thomas E. Johnson lost his life. 20 Dec 1943 576th Sqdn. P LoPresto, H.C. 2nd Lt.
CP Collins, J.M. 2nd Lt.
N Siggs, P.S. 2nd Lt.
B Machak, J.G. 2nd Lt.
P Rouse, M.S. 2nd Lt.
CP Schumacher, R.L. 2nd Lt.
P Becker, J.R. 1st Lt.
CP Bunting, D.W. 2nd Lt.
N Feller, L. 2nd Lt.
AR Williams, A.L. Jr. Sgt. B Greene, D.R. 2nd Lt.
P Clover, D.K. 1st Lt.
CP Berger, R.M. 2nd Lt.
N McMillan, W.J. 2nd Lt.
B McDonald, P.R 2nd Lt.
20 Dec 1943 577th Sqdn. P Egan, R.L. 1st Lt.
CP Basham, F.G. 2nd Lt.
N Harris, W.B. 2nd Lt.
B Floyd, C.E. 2nd Lt.
P Layton, S.H. 1st Lt.
CP Jensen, A.H. 2nd Lt.
N Donaldson, C.D. 2nd Lt.
B Feagan, H.C. 2nd Lt.
P Brauer, G.M. 2nd Lt.
N McGough, J.G. 2nd Lt.
B Eldridge, H.N. 2nd Lt.
B Salsberg, M. 2nd Lt.
P Breckenridge, L.G. 1st Lt.
CP Holm, H.J. 2nd Lt.
N Snyder, R.D. 2nd Lt.
B Dilly, V.S. 1st Lt.
AR Magee, J.H. Jr. Sgt. G Troxel, D.G. Jr. S/Sgt. CP Williamson, D.R. 2nd Lt.
P Gonseth, F. Jr. 1st Lt.
CP Slipp, F.E. 2nd Lt.
N Beatson, R.J. 2nd Lt.
N Delach, J.J. 1st Lt.
B Colburn, R.F. 1st Lt.
20 Dec 1943 578th Sqdn. P Stauder, J.B. 1st Lt.
CP Johnson, R.L. 1st Lt.
N Haenzi, W.R. 2nd Lt.
B Hunter, R.M. 1st Lt.
R Whitmore, B. Jr. T/Sgt. P Fletcher, R.E. 1st Lt.
CP Graham, G.E. Jr. 2nd Lt.
N Woody, H.E. 2nd Lt.
B Judd, G.W. 2nd Lt.
P Lishka, A. 1st Lt.
CP Feld, B.H. 2nd Lt.
N Moorehead, J.C. 2nd Lt.
B Brockway, O.E. 2nd Lt.
P Smith, R.E. 2nd Lt.
P Peterson, C.L. 2nd Lt.
N Cound, A.L. 2nd Lt.
P McKee, T.R. 1st Lt.
CP Walker, T.G. 2nd Lt.
N Johnson, D.C. 2nd Lt.
B Simons, L. 2nd Lt.
AR Murphy, H.G. Jr. S/Sgt. P Sooy, B.L. 2nd Lt.
CP Mardis, W.B. 2nd Lt.
20 Dec 1943 579th Sqdn. P Detrick, J.W. 1st Lt.
CP Schneider, J.E. 2nd Lt.
B Hall, H.P. 1st Lt.
P Cassell, H.S. 1st Lt.
CP Colvin, J.A. Jr. 2nd Lt.
N Bevan, K.S. 1st Lt.
B Cetin, W.F. 1st Lt.
P Peyton, J.B. 2nd Lt.
CP Rueffer, A.P. 2nd Lt.
N Richards, D.U. 2nd Lt.
B DeMontier, H.E. 2nd Lt.
R Connor, D. Jr. S/Sgt. P Hull, R.L. 2nd Lt.
CP Durrance, E.E. 2nd Lt.
N Coleman, V.B. 2nd Lt.
B Lessey, J.E. 2nd Lt.
P Higgins, J.A. 1st Lt.
CP Wharton, P. 2nd Lt.
N Casey, H.W. 2nd Lt.
B Broyles, C. 2nd Lt.
P Everhart, W.C. 1st Lt.
CP Sassaman, F.J. 2nd Lt.
B Chatten, J.F. 2nd Lt.